Earlier this week while at Kroger I noticed some baby lotion in the clearance bend from Earth’s Best Organics. Since this was already a brand I use with Elle-girl’s foods, I thought I would try it. I’ve loved it! It’s true lavender, and smells yummy, and it goes on so smooth, unlike other thick lotions. Elle-girl, who has always hated getting rubbed down with lotion, also seemed to love it. She lays very still while I apply the lotion before bed, then she carries the bottle around the house during the day. 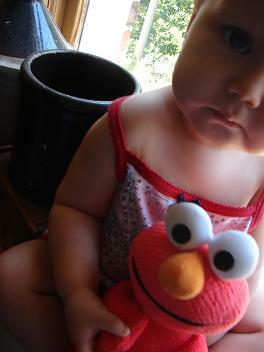 I started to notice as she carried it around she would sing the Elmo song that she learns on Sesame St.